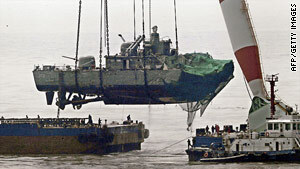 Forty-six sailors died when the South Korean vessel sank on March 26. Washington (CNN) -- The U.S. military will conduct joint exercises with the South Korean military in response to that country's announcement that North Korea was behind the recent sinking of one of its warships, the Pentagon said Monday. Whitman would not discuss details or timelines on the two exercises, but noted that they are being planned in response to the March 26 sinking. The South Korean government said its probe of the incident concluded that North Korea fired a torpedo responsible for sinking the vessel. Forty-six South Korean sailors were killed as a result. Whitman said the maritime interdiction exercise will be conducted as part of the Proliferation Security Initiative, which is designed to prevent the trafficking of weapons of mass destruction and related technologies. North Korea is suspected of moving such material by sea. The submarine exercises are designed to hone overall naval skills while testing South Korea's anti-submarine capability, Whitman said. The Pentagon announcement came on the heels of a statement from Secretary of State Hillary Clinton on Monday that the U.S. government backs the conclusion of the South Korean probe into the incident. Clinton urged North Korea to reveal what it knows about the "act of aggression." She also said the United States' "support for South Korea's defense is unequivocal" and that North Korea should "stop its belligerence and threatening behavior." President Obama on Monday directed U.S. military commanders to work with South Korean troops "to ensure readiness and to deter future aggression" from North Korea, according to a White House statement. South Korean President Lee Myung-bak, meanwhile, announced Monday that his country was suspending trade with North Korea, closing its waters to North Korean ships and adopting a more aggressive military posture toward its neighbor. Lee said his country was adopting a posture of "proactive deterrence" toward the North. He promised that "combat capabilities will be reinforced drastically" and that he will focus on improving national security readiness and military discipline. Lee said the alleged attack violated the armistice and nonaggression agreements between the two countries, and said he will refer the incident to the United Nations Security Council "so that the international community can join us in holding the North accountable." North Korea's government has emphatically denied any responsibility for the incident. Last Friday, North Korea threatened to back out of the nonaggression pact with South Korea after Lee vowed "resolute countermeasures" against the North. On Monday, the North Korean government threatened to fire at South Korean loudspeakers if they resume broadcasting along the heavily armed border between the new nations, South Korea's Yonhap news agency reported. "Firstly, from now on [North Korea] will regard the present situation as the phase of a war," North Korea's Committee for the Peaceful Reunification of Korea said Friday, according to Yonhap.